Motorsport Auto was established in 1979 by partners Ken and Greg Smith, who happen to be father and son. Back then, mail order auto parts specialists were a novelty. But Ken and Greg had a vision: become a full-service cataloger of every part and accessory a Z-car owner could ever possibly need or want, and build the company on a foundation of customer service. The vision also included top-notch technical assistance. Motorsport would not be staffed by order-takers at some remote bureau, or high-pressure, commissioned salesmen. Instead, every customer service team member would be a Z-car expert, helping clients select just the right parts for their project. The company would also be dedicated to personal service, where the customer can choose whether to call a toll-free number, send mail (and now of course e-mail), fax, or visit a showroom. And Motorsport would fully staff all of those areas during business hours for the customer's convenience. Today, that vision has become reality. Over 7,500 square feet of inventory means we can ship most parts right away. 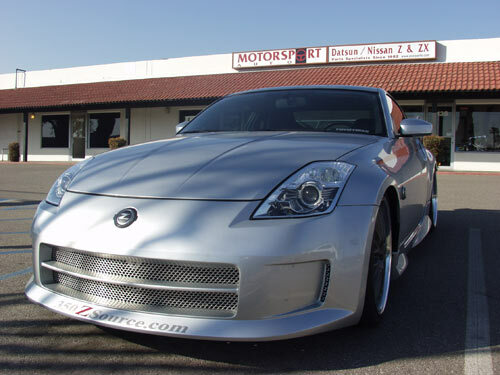 And our online store is the largest Z-only store there is, with well over 6000 available parts (for all Z-Cars). Motorsport is proud to serve Z and ZX enthusiasts worldwide. We look forward to being able to serve you, too.